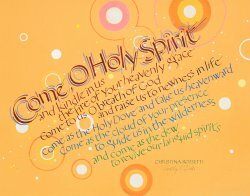 Come, O Holy Spirit, and kindle in us the fire of your heavenly grace. Come to us, O breath of God and raise us to newness in life. Come as the Holy Dove and take us heavenward. And come as the dew to revive our languid spirits.